Mark and our lawyer, Jim, gave a very extensive overview and Q&A during a livestream today, covering how these regulations affect City State Entertainment and our Backers. If you missed that stream, you can find that HERE. As stated in our previous email, we are wiping the forums clean, and expect to have them back up next week. Additionally, gift codes and the combine or upgrade pledge functionality will be non-functional in our store until we make further changes next week. For the rest of the week’s highlights, including art from our talented team, read on! WIP – Plot Control: Christina has been working on new features for plots, partially to improve the testing experience during Beta. Plot deeds got a major upgrade, and now have options in your inventory for opening the map, viewing plot information, and teleporting to your plot (available on safe island plots only when in the same zone as the plot). Plot API calls such as “abandon” and “change permissions” were upgraded to work across servers (and in the case of abandon, even if the zone is not currently online). Plot DevUI got a facelift. Behind the scenes, it works with both cross-server, online, and offline plots. It also has better controls for modifying permissions on your owned plot, and new options, such as generating a plot deed for your owned plot if you are missing it for some reason. Plot permission updates for owned plots have changed. Owning a plot gives build permissions to your account’s other characters of the same faction. In addition, limits for how many plots an account can own is now limited based on shard/faction, with two limits for safe vs. contested islands. Tech – Testing and Forums: Early this week, Brian tracked down an issue with slowdown of the scenario UI results page, which was handed off to AJ. For the rest of the week, we shifted from running tests, so Brian could focus on pulling pinned content from the forums. Over the next several days, Brian will be working on setting up the new forums, making sure they work as expected, and that people can still find all our previously posted important info. Tech – UI Improvements: AJ added dynamic updating of the skill bar, which will allow us to swap it out for a different one based on what the player is doing, like placing items in a building plot, for example. He also fixed the UI reset button, moving of UI widgets, and is currently working on performance improvements when generating very long lists of items, such as the end-of-scenario results screen, which became laggy with 100+ players. WIP – Design: This week, Ben mocked up a template for the home islands on which Tyler and Dionne will begin placing assets. He set up the completed trait icons on all the new traits we’ve added, and worked on item loadout changes based on our new class-specific animations. Currently, he’s working on the progression system with Christina to make sure it supports our plans for B1 day 1. WIP – Tech – cross-server scenario: Colin hopes to get his work on this system into review today. This will allow players to queue from different servers into the scenario matchmaking system, an important feature for B1 when we are supporting multiple islands. WIP – Tech – Audio – LOD and Format Updates: Dave is working on a format update to support removing sounds based on distance or type of sound. Changing how the client loads the audio data will also result in lower audio latency, and will allow us to do more interesting things, like priorities on sounds. This will give dB greater control over important audio queues in the game. WIP – Art – Concept: Michelle completed VFX concepts of the Fianna and Stone Healer’s special abilities, and has begun work on Realm-specific pub and bank signage, as well as Realm-specific outdoor lamps. 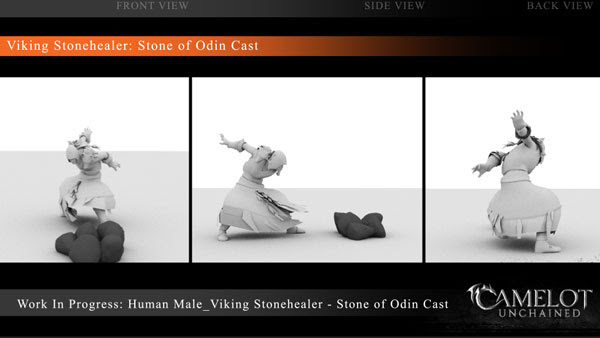 WIP – Art – Updated Class-Specific Animations: This week, Sandra began work on the Physician, starting with the idle pose. She and Scott also made some timing changes to the previously-completed class basic attacks, so they’ll work better with the design of weapon stats. 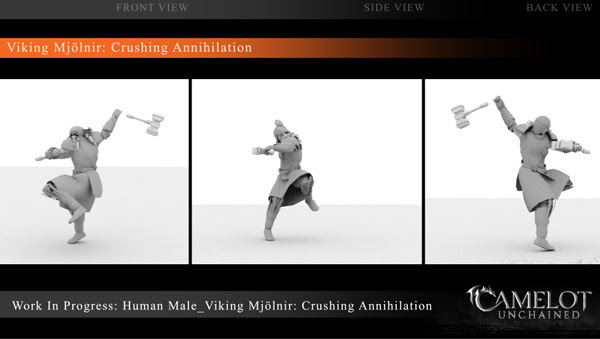 Scott finished off the Mjölnir’s animations, including improvements to the travel animations, and he rigged the Forest Stalker’s quiver and Physician’s belt. Next week, he’ll get back to his work on the Fianna, starting with an update to the special ability. 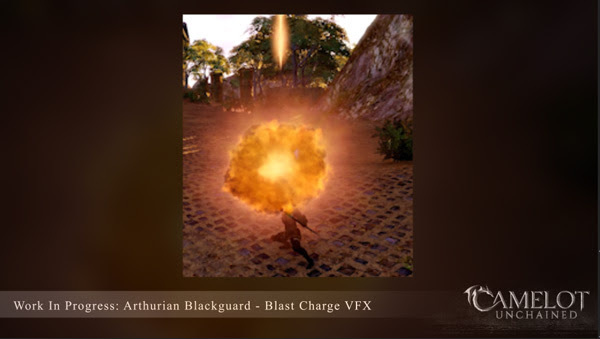 Art – SFX – Victory and Defeat Music: dB created music for our scenario Victory and Defeat results pages, which will be added in next week with AJ’s help. WIP – Art – Ability VFX: This week, Mike blocked in the Forest Stalker and Winter’s Shadow special abilities. He’ll next move on to the recently updated Mjölnir special ability. WIP – Art – Environment Art: This week, Dionne finished several variations of the spruce trees, which Tyler hooked up into a terrain mod for later use. This also included hue variations of those trees and the pre-existing pines. Dionne focused on new grass cards this week to support the bog and coastal grass, while Tyler continued work on new terrain materials. Dionne also did some cleanup on the Place of Power collision, based on testing feedback. Art – Updated Character Creation Renders: Joe finished off all the female poses for the various race/class variations this week. The next step is to create the renders and integrate them into the character creation UI. Some good stuff in this week’s highlights. I’m particularly interested in hooking up our NPC greeters on the new zones we’re making! When it comes to these new ability animations, Michelle is staying one step ahead of Mike’s VFX work. 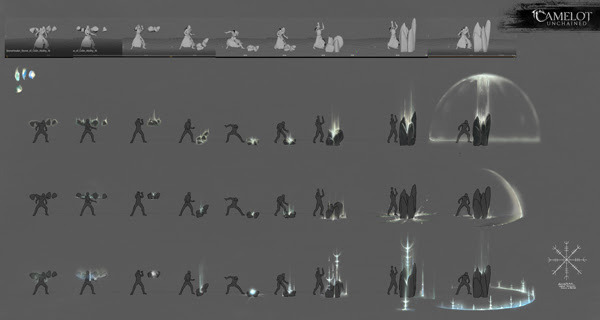 This week, she worked on the Stonehealer’s new ability based off Joe’s WIP animations, which I’ve re-linked below the concept. 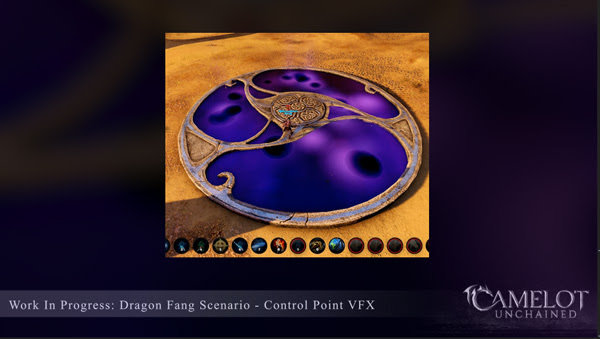 Mike, the perfectionist he is, surprised us when he decided to share a few low res captures of some of his VFX WIP. Click the images to see the videos. First up is a WIP of the Blackguard’s ability, where he powers up an extra-impact attack. 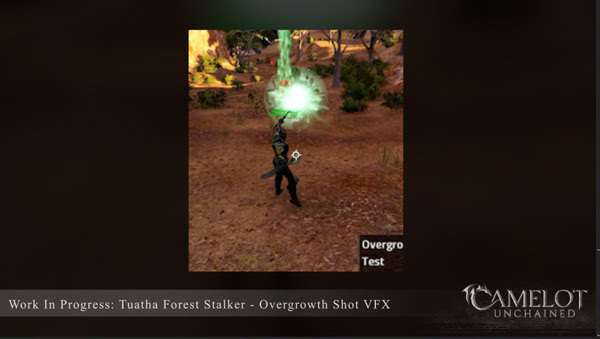 Our third WIP VFX is of the Forest Stalker’s Overgrowth Shot. Next up, we have some environment work from Tyler (myself) and Dionne. 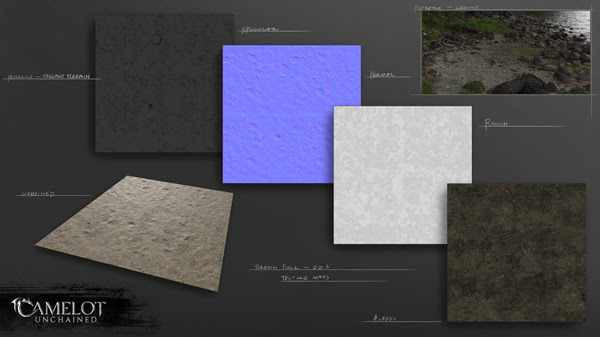 I’ve been working on new terrain materials for more variation in our coastline. The image below will be a generic rock material based off the rocks in the included picture from Andrew’s trip to Ireland. Final color tweaks will come later once all the terrain bits, including rocks, grass, and debris are complete. 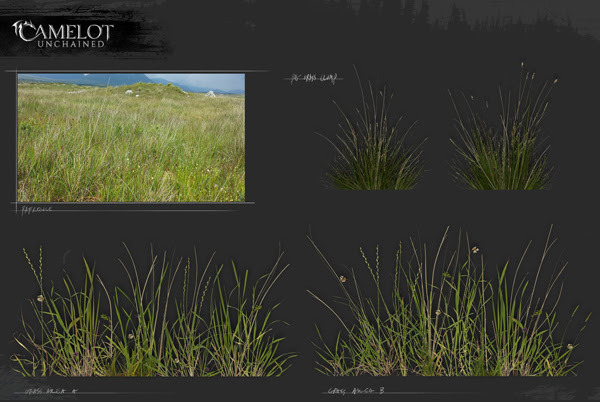 Dionne began work on the various grasses based on Andrew’s pictures from the bog he visited. These will pair up with the materials I (Tyler) created last week HERE and HERE. As with the image above, final color tweaking will come at the end. Interesting thing about these grasses: the assembly and layout is done by hand, often per blade of grass when needed! I’m particularly inspired by Dionne’s hard work on these assets, and can’t wait to put this all together on one of the Beta 1 islands! You may have also noticed art for the week is missing some spectacular sculpting work from Jon. Unfortunately he’s been out sick, but messaged me today to let you all know he says hi and misses everyone! That wraps up this week’s update. We will be out of the office on Monday, May 28th, in observance of Memorial Day. Until next week, CU later!